Havana may be a metropolis of two million souls, but you wouldn’t know it by looking up: The night sky here boasts stars as dense and bright as you’d glimpse among the woods of Maine. For decades now, the city’s lack of electric light has been as key to the feel of its streets as the dearth of cars that actually work. It wasn’t always like that, of course: In the 1950s, Havana had an electric grid that rivaled Chicago’s or Los Angeles’s, with light pollution to match. During the era of Prohibition in the US, this city was a thicket of cabarets and neon. It was also the world’s best place to see a movie. By 1959, Havana boasted some 358 theaters—more than either New York or Paris. 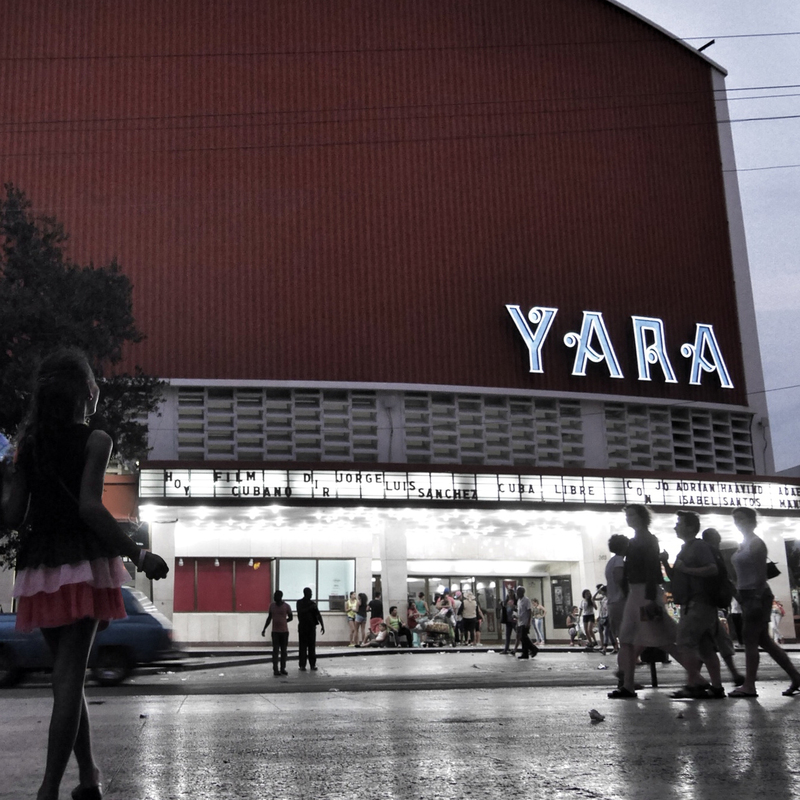 After Fidel Castro’s bearded rebels kicked out the mob and began building Cuban Communism, many theaters disappeared. But many remained: Cubans’ love for film never wavered. Each December since 1979, the Festival of New Latin American Cinema has drawn throngs of visiting cineastes and locals alike. The landmark theaters they flocked to, though, decayed. Films were as often presented on old TVs as projected on now-tattered screens. And on stucco façades or vaulted marquees, up until a year ago, all that remained of gorgeous old neon signs were their rusted outlines. But then something changed. As new rules began allowing a modicum of private enterprise, and a new tide of foreign dollars hit town, the lights began to flicker back on. In Havana now, landmarks I’ve passed a hundred times—like the eponymous cinema looming over 23rd Street and 12th—are dim no more. The return of neon to Havana, like many recent changes here, has had less to do with the government’s initiative than with its citizens’. The lights’ return also involved cooperation, like many new enterprises in Havana, between one Cuban living here and another who’s based abroad but keen to engage back home. That’s the formula behind countless new cocktail bars that have opened up since Raúl Castro made such businesses legal, in 2011. But Havana’s movie theaters are still owned by the state. 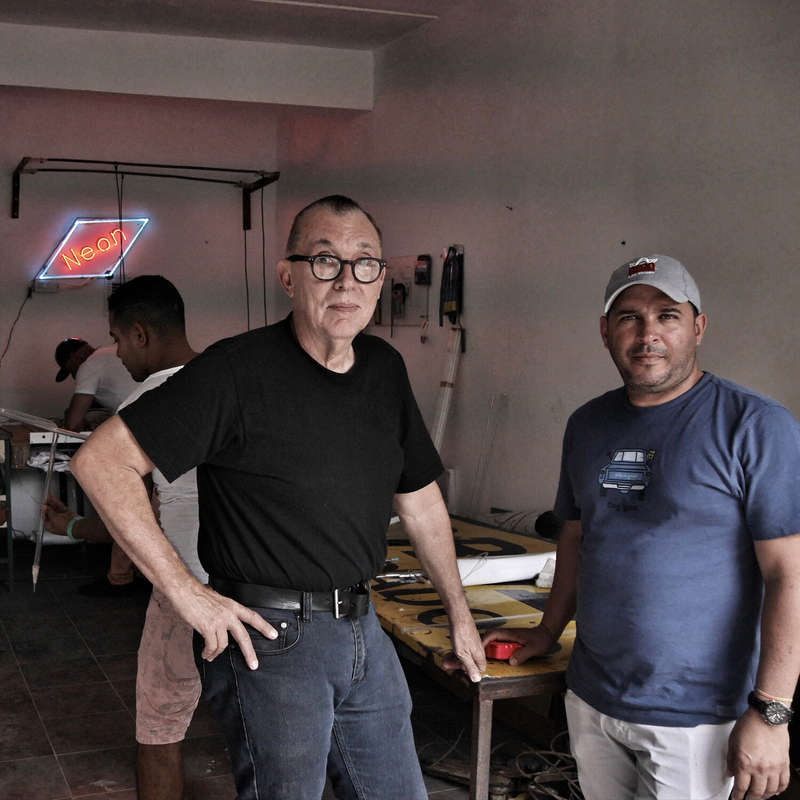 And the project to outfit them with gleaming new signs—a partnership between Adolfo Nodal, a Cuban American impresario based in Los Angeles, and Kadir López Nieves, one of Havana’s leading artists—has aimed not to make money but public art. “Havana Light,” as the pair call their project, was launched at the Havana Biennial in May 2015. We went to see them at López’s home studio, in whose adjoining garage they’ve set up a workshop for bending glass tubes. 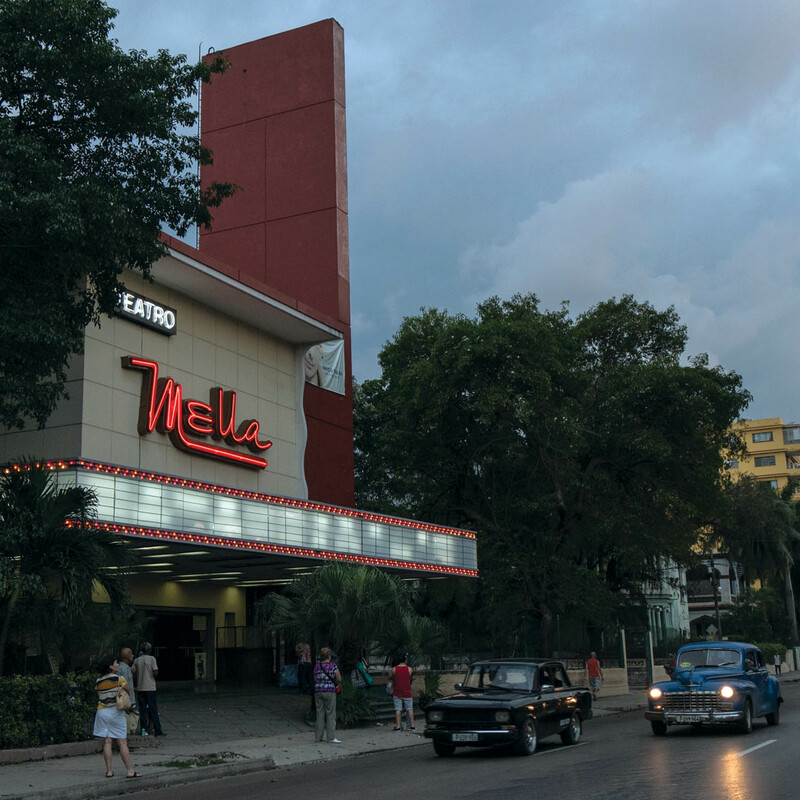 The Mella theater is perched on one of stylish Vedado’s main boulevards, a few blocks from the sea. Opened in 1952 as the Rodi Cinema, the 1,700-seat theater was renamed after the revolution, in April 1961, for a martyred Cuban communist. 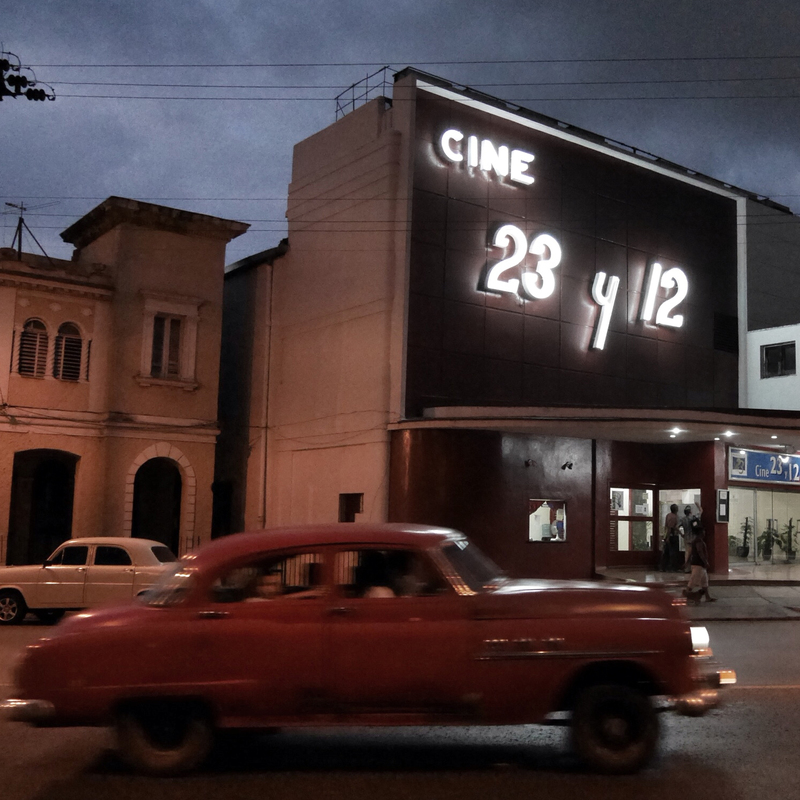 To honor Julio Antonio Mella, Fidel Castro’s government also commissioned a neon sign whose bending form echoed both the lines of the Fords out front and the Gaudí-esque curves of the theater’s balcony inside. From that balcony over the years, I’ve caught performances by the greats of Cuban jazz and dance. But it wasn’t until late 2015 that I saw the Mella’s marquee lit up. Its spectacular new sign, restored by Nodal and Havana artist Kadir López, was afforded with the help of some musician friends from New Orleans—the storied Preservation Hall Jazz Band, who donated the funds to build it just before visiting Havana for the first time. On the night the sign first buzzed alive, the band stood cheering on the sidewalk out front. Then they took the stage, with a troupe of Cuban musicians, and brought down the house. 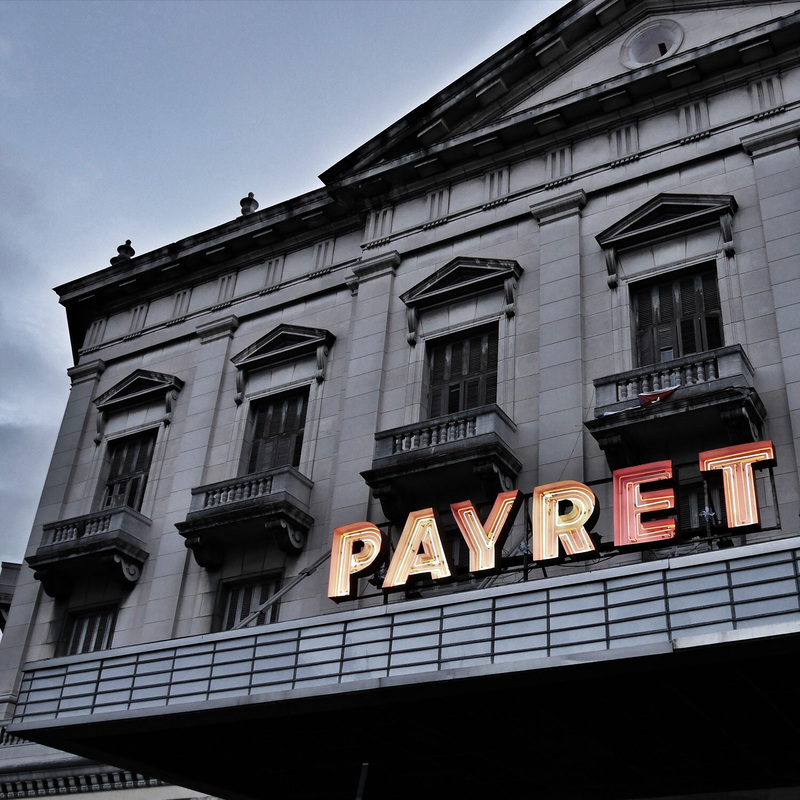 The Havana theater now known as the Cine Payret first opened in 1877, a building funded by Cuba’s nineteenth-century sugar boom, with seating for nearly 2,000 people. Sited on Old Havana’s edge and near its colonial port, the theater hosted the zarzuela musicals that once ruled Cuban theater, along with ensemble performances of danzas by local composers such as Ignacio Cervantes. In the 1920s and ’30s, the Payret’s stage hosted boxing matches that helped turn more proletarian icons, like the Havana-born pugilist Kid Chocolate, into heroes. In the 1940s, the Payret’s interior was redone and Cuba’s leading exponent of Art Deco sculpture, Rita Longa, affixed nine plaster muses to its walls. When it reopened in 1951, as one of Havana’s grandest movie palaces, a protruding marquee—and multihued neon sign—were added to the stone façade. Like other theaters whose signs have been restored by Havana Light, the Payret isn’t in operation (it’s been “closed for repairs” for years). Yet when we showed up, the front door was ajar. We entered the dingy lobby. A young man emerged from the darkened theater whose sloping rows of seats were mostly gone. He was the nephew of a watchman charged with guarding this pile, and an artist (he’d taken to using the theater as his studio). He showed us, there in the dust under Longa’s muses, his own small sculptures made from wire, as well as thick sheets of artisanal paper he’d made from scraps of newsprint and which were hanging to dry in the haze all around us. He told us how, when the Payret’s sign was first turned back on a few months before, people from the neighborhood had stood out front gazing at it wide-eyed, reminiscing. Then he flicked a switch so we could ogle it ourselves, and disappeared back into his cave of paper and wire. Back outside, the sign’s colors were reflected in puddles left by an afternoon shower, and in the mirrored sides of tourist buses splashing through them. These dispatches are from #VQRTrueStory, our social-media experiment in nonfiction, which you can follow by visiting us on Instagram: @vqreview. Joshua Jelly-Schapiro is the author of Island People: The Caribbean and the World (Knopf, 2016), and the coeditor, with Rebecca Solnit, of Nonstop Metropolis: A New York City Atlas (California, 2016). He has written for the New York Review of Books, the New Yorker, Harper’s, the Believer, Artforum, and the Nation, among many other publications. He holds a Ph.D. in geography from UC Berkeley. Mirissa Neff is a photographer, producer, and public-radio and television journalist. She is working on her first film.